The concern over the future for downtown commercial districts was not limited to Winchester. The National Trust for Historic Preservation saw and studied this need to stabilize downtowns against unprecedented pressures. The most common factor cited by the National Trust for the decline of downtowns across the country included the rise of new commercial construction in the form of strip malls. The Trust cites an increase in retail space from 4 square feet to 38 square feet per capita between 1960 and 2000, an increase which could not be supported by consumer spending. Instead of expanding the number of commercial enterprises, businesses were more likely to migrate to these newly constructed spaces. Other factors the Trust cited that may not be quite so obvious at first glance stemmed from changes in land use. Zoning regulations fundamentally changed the way towns grew. In the past, small businesses and homes could coexist side by side, with neighborhood stores serving a few blocks as the need arose. Even larger businesses could be just a short walk from residences, or cause a new residential neighborhood to spring up around it to provide housing for the workers. With zoning regulations more firmly separating the notion of residential and commercial districts, main streets with their “mixed use” character were out of date. In general, upper story living spaces were erased from downtowns. The last factor is the “car culture” that rose in the wake of increased American prosperity, fueled by the interstate highway systems making travel by car faster and more efficient. Downtowns were ill-equipped to adapt to cars, leading to unprecedented numbers of tear downs for parking lots and gas stations. Highways often bypassed towns completely, isolating the older commercial districts and leading to the boom of commercial construction along these new travel corridors. The pedestrian mall changes to Winchester in the 1970s was an early way the town tried to adapt to the changing retail market. By 1981, it was clear this was an insufficient band aid to a deeper, endemic problem. The area’s first major competition to the downtown was looming as the Apple Blossom Mall project was becoming a reality — and taking key stores out of downtown. Something had to happen to prevent a complete collapse of the downtown. PHW became aware of the test programs spearheaded by the National Trust taking place in select cities in the late 1970s. 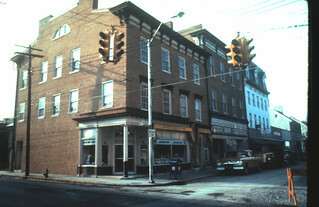 When the test program was preparing to launch in Virginia, PHW collaborated with the City in the attempt to bring the Main Street Program to Winchester. We succeeded. In 1985, National Trust experts descended upon Winchester to help set up what we know of today as the Old Town Development Board. But even before the program launched, Winchester and PHW were experimenting to keep activity in Old Town, which we will cover in more detail in the coming weeks.